In case you missed it, Russian food is all the rage at the moment. Unfortunately, despite a not insignificant Russian population, there aren’t a lot of choices for exploring Russian cuisine in Phnom Penh. Luckily for us, Phnom Penh stalwart Irina Restaurant is still going strong, serving delicious Russian fare in their 10th location since 1999. Irina Russian Restaurant is a long-time player in the Phnom Penh food scene (but that’s not a bad thing). Irina Russian Restaurant has always deserved more attention than it has gotten, and been all but ignored by most non-Russian speakers. Over the years, the quality has waned and waxed, but the restaurant is now in the hands of Irina’s daughter Alina, who has brought renewed energy to the existing menu. If you’re not used to Russian food, it’s easy to think it’s stodgy, bland, and homogeneous. But the food of Russia and of the greater region — which Russian cooks have adopted and adapted — is surprisingly flavorsome and diverse. This diversity is seen on the extensive Irina menu, which features both classic Russian and Ukrainian dishes, but also specialties from the former Soviet states, including Georgia and Uzbekistan. When we visited, we ordered five dishes between four of us, and after finishing, couldn’t resist ordering a few more. We liked it so much, in fact, that we went back again the next night. As such, I’ve now tried a large selection of the menu and feel confident in declaring that it is delicious. Our favorite was the golubtsy, a dish with a strangely unappealing sounding name to my non-Russian ears, but the savory pork-stuffed cabbage with a thin mushroom bechamel was especially good. With just three pieces, our group of four fought over them, and we ended up ordering it the next night as well. 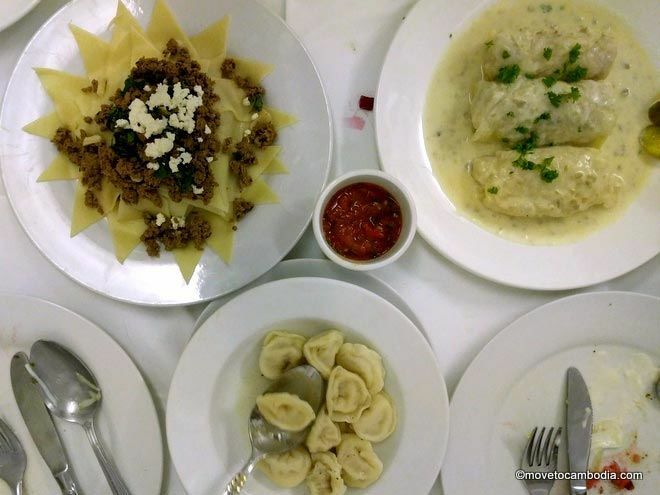 Khazak beshbarmak, Russian golubtsy, and Ukrainian pelmeni. The other dish that reached two-nights-in-row status was the selyodka, Russian-style salt-cured mackerel, here served with thinly sliced onions, a few pieces of boiled potato, and a giant shot of vodka. The combination of the vinegared fish and spicy onions, offset by the simple potatoes was divine, perfectly matched with the bracing sips of vodka. The starters were my favorite part of both dinners. We also tried the blini with salmon, mixed mushroom, green tomato, and cucumber pickles served with either mackerel or salmon and a shot of vodka, and vinegret, a beet and vegetable salad with pickles. Other dishes we tried were khachapuri, Georgian cheese-filled pies, feta meatballs, pelmeni, a type of pork dumpling, vareniki, or cottage cheese dumplings, and beshbarmak, a Kazakh dish of homemade sheets of pasta, and savory spiced beef. Everything we tried was excellent, but I’ll admit to being a bit confused by the okroshka, a chilled kefir soup with chopped vegetables and meat. We asked to try their homemade kefir on its own, but what they brought over was, as far as I could tell, sour cream and not kefir. Memories of the (Russian) days of yore. Dishes were all reasonably priced between $4 and $7. Vegetarians will be happy to hear that the menu features an extensive array of vegetarian dishes (another surprise to those who aren’t familiar with Russian cuisine) including dumplings, mushroom golubsky, and draniki — crispy fried potato pancakes served with homemade sour cream. Irina Restaurant also sell frozen homemade dumplings by the kilo as well as their homemade sour cream and cottage cheese for takeaway. 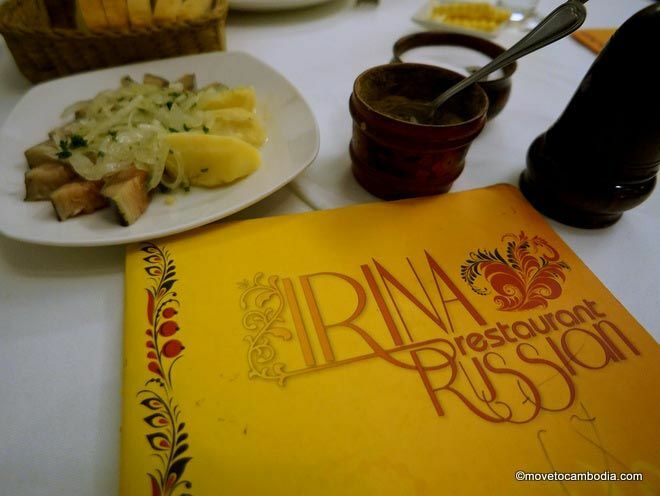 Although Irina’s offers a delivery menu, it’s worth visiting the restaurant to see the collection of Russian and Soviet tchochkes and memorabilia, that are presented in a such a way that it is unclear if it is meant to be ironic, sincere, or both. The outside of the restaurant is adorned with what appears to be the actual nameplate from the former Soviet Embassy in Phnom Penh and Soviet propaganda posters. 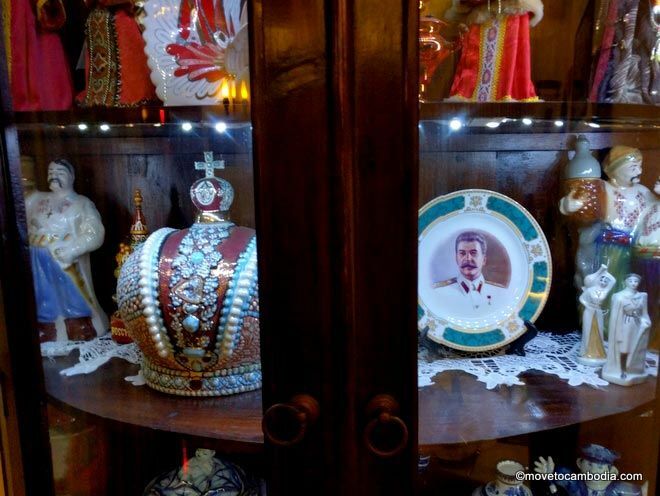 Inside you’ll find a curio cabinet filled with Russian nesting dolls, porcelain figurines, and a Stalin memorabilia plate. Between the food, the vodka, and the quirky atmosphere, Irina Russian Restaurant makes for an excellent evening out in Phnom Penh. 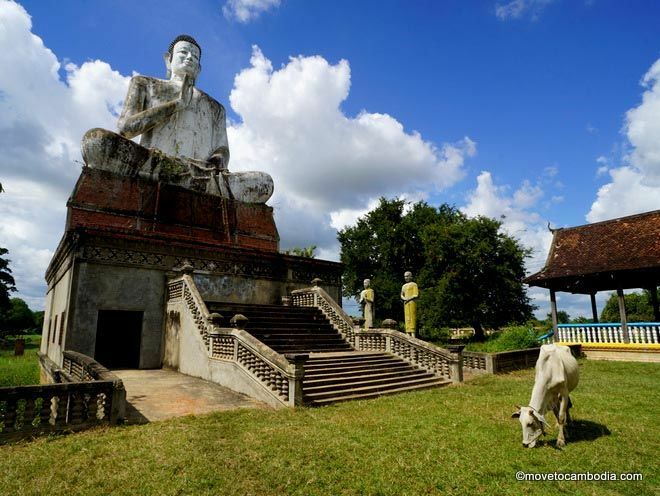 This entry was posted in Phnom Penh, Food and tagged Russian, Irina Russian Restaurant, Vegetarian. Bookmark the permalink. Wow! How did I miss this place over the years? Thank you so much for this review, Lina — I’ll be making my way to Irina’s one day soon. Definitely do! There are a surprising number of choices for vegetarians. We’ve got some more herbivore content in the works!